Eddie Young is a kirtan musician, artist, video editor, and animator. Eddie’s life-long year career as a humorous cartoon illustrator has been an amazing journey of creativity and fun! He also has been combining his artistic and musical talents in many Video and Animation projects. A master cellist and bassist, Eddie has played music and drawn funny pictures since he was a kid in the 50s. Now he’s a kid in his 60s! 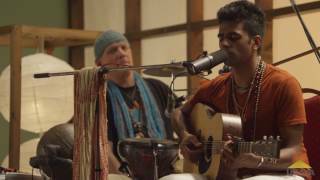 Discovering the sacred music of kirtan was a life-changing event. Making friends and making music in this kirtan community has been a blessing beyond words. Eddie is the father of four lovely children that are all happily married and raising families of their own. Eddie and his wife, Susan live in Long Beach, CA and appreciate every single day together.